Many holiday memories are conjured up by the smells of the season. From the whiff of a perfect fir tree permeating the living room to Grandma's highly spiced (and highly potent) eggnog, these holiday aromas create cravings for cozy family evenings and the crinkle of gaily wrapped gifts. But the onset of festivities may bring with it high levels of stress as presents must be bought, holiday menus planned, parties attended and dozens of cookies and treats baked. What everyone really needs is a night out with good friends, some wine, an appetizer or two, and a basketful of homemade cookies to take home to convince a mother-in-law that her family has been hard at work all December. Enter the Christmas cookie exchange. "Everyone bakes cookies, brings them to the party and then takes a selection of everyone else's cookies home," said Leigh Koonce, a Hailey resident who hosted a cookie exchange last weekend. "It's also a nice way to see what everyone is up to for the holidays." A uniquely American tradition, the cookie exchange has grown in popularity in recent years. Nancy Rutherford, owner of Rolling in Dough, said that over the past week she's had half a dozen people pop into her Ketchum store pleading for her cookie dough. "Everybody has been coming in here asking for dough because they don't have time to make it themselves!" she said. "It seems to be a very popular deal this Christmas." "People call me up all the time, saying, 'I don't have time to bake, can you make them for me?'" Jones said. And if it's even too late for that, Jones' highly decorated cookies featuring snowflakes, gingerbread boys, snowmen, Santa Clauses, dreidels and menorahs are available at Rasberrys, Penelope's Café, Atkinsons' Markets and Main Street Market. Diane Hull, head baker at Cristina's Bakery, has been to more than a dozen cookie exchanges over the years. "It's lovely getting other people's cookies, seeing what they make for the holidays and getting new ideas." she said. This year she's whipping up almond cookies with raspberry jam, chocolate orange Christmas cookies, peppermint pinwheels and thumbprints in the Ketchum restaurant's kitchen. Assuming most of the attendees found the time to bake their own, a lovely tradition to share at a cookie exchange is to have each guest "present" his or her cookies, telling the group how it fits into his or her family holiday traditions. From "my Brazilian grandma's secret recipe" to "a treat I discovered on my honeymoon in Portugal," this fun game will unearth some surprising facts about friends and family. "It's a great opportunity to get a big variety of cookies that then you can turn around and give as gifts," said Alex Taylor, a waitress at CK's Restaurant in Hailey who has hosted a cookie exchange. "It's also a great way to just have some girl time. I think it's important not to have any pressure to make the most beautiful cookie—you can go to Atkinsons' and buy cookies if you want—it's more about being together, having a glass of wine and taking some time to relax." - Have guests bring a dozen cookies (preferably homemade, but don't insist) for each attendee and copies of the recipe to hand out. ( Supply festive bags for guests to take cookies home in. 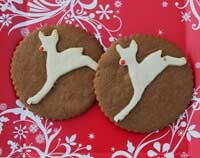 - Prepare a large table, decorated with a festive theme, for everyone to set out their cookies on. - Hold the party in the morning and serve the cookies with milk, or make it part of a holiday cocktail party, saving the cookies for guests to take home. Nancy Rutherford's festive shortbread cookies are simple to make and take along to a cookie exchange (or, for those in a rush, easy to pick up at her Ketchum store). Make two separate doughs (traditional shortbread and gingerbread). Use the gingerbread dough as the round cookie and then, using a festive cookie cutter, create shapes from the shortbread dough and place on top of the gingerbread dough. Gingerbread: As above, substituting brown sugar for confectioner's sugar and adding molasses and powdered ginger. Other options include adding chocolate powder or vanilla flavoring. Directions: Combine butter, sugar, salt and egg and blend until smooth. Add flour and mix until just combined. Overmixing (and over-rolling) will quickly ruin cookie dough. Wrap the dough in plastic and freeze until firm (30 minutes). Roll out and cut circles and shapes. Assemble cookies and bake in preheated oven (350 degrees) until golden brown around the edges (15-18 minutes). Rutherford uses Indian Tree's Bowl of Cherries cookie decoration for the reindeer's red nose (available at Atkinsons' and Ketchum Kitchens). "Be careful what you use," she said. "You don't want it bleeding into the dough as it cooks."